In cocktail shaker containing enough ice, combine the tomato, orange and lemon juices. Add honey, onion, Tequila and hot pepper. Add the Worcestershire sauce and shake well. Serve immediately in the chilled glasses, with a touch of coarse salt on the rims. Grapefruit or blood orange juice can substitute for orange juice. Chill the glasses prior to serving to ensure a more refreshing and tempting drink. Garnish with a lemon or orange wedge on the rim of the glass previously rubbed with coarse salt. I would like to share a special recipe with you. It’s a drink living up to the name of enigmatic nocturnal creatures that survive on blood: vampires. We’re about to celebrate Halloween and the popular Día de los Muertos (Day of the Dead). Mexico is a country of traditions and ancient customs dating back to its ancestors, with an endless variety of traditional dishes and original drinks, among them one by the name of Vampiro to celebrate this holiday with its unique drink: Tequila. 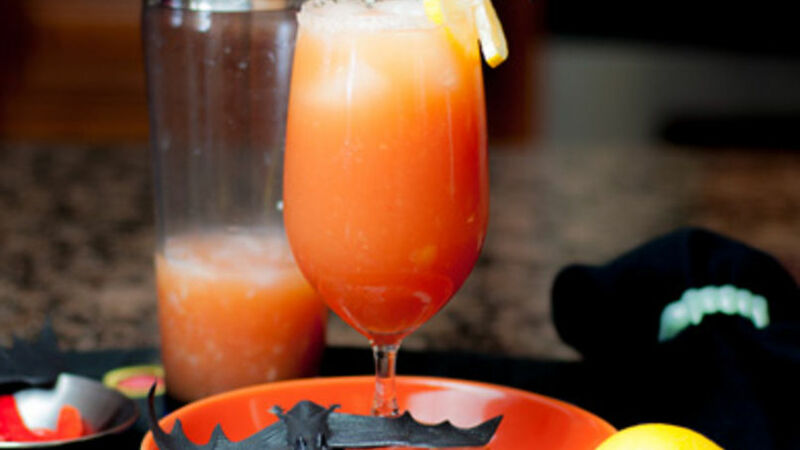 However, Vampiro has become an appealing drink for all occasions. When you have the pleasure of tasting a sip of Vampiro, your senses will experiment the mix of sweet, citrus and spicy flavors found in it. It’s an explosion of flavors worthy of sharing, one that includes an attractive red color due to the addition of tomato juice to the mix. Enjoy!